Consumers rush to buy wares at Canada's travelling "health show"
The new face of the average Canadian health care consumer belongs to a well-educated, middle-income, middle-aged woman who is actively involved in her own well-being. She is very interested in diet and nutrition, longevity, alternative medical therapies, vitamins and antioxidants. And she's willing to pay: she spends between $500 and $1000 a year on health supplements. This consumer profile was created from data gathered by Canadian National Health Shows, a private-sector company that holds alternative health care trade shows across the country. Thousands of Canadians have already attended weekend shows in Victoria and Ottawa this year, and thousands more will undoubtedly attend shows planned for Halifax, Edmonton and Vancouver. Figure 1. 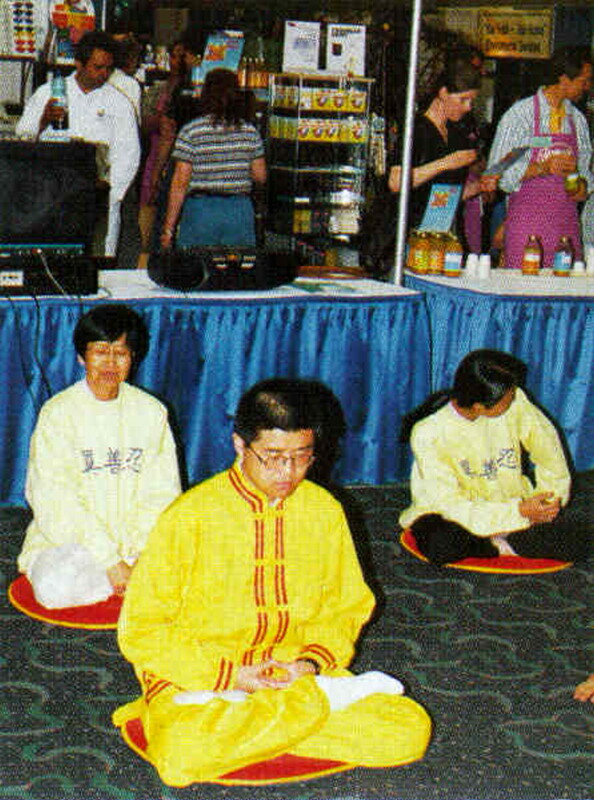 The Chinese exercise and meditation system, Falun Gong, appears to be at odds with the show's commercial aura. Gail McDonald is part of the new wave of health care consumers who attended the Ottawa show. "People are more educated, more literate," she explained. "The doctor-as-god status is gone. We're not willing to give up our healing to authority." Madeline Monsour, of Nepean, Ont., also matches the show-attendee profile. Since being diagnosed with fibromyalgia 5 years ago, she has been researching alternative therapies to help deal with her pain. "I don't know much about [homeopathy] but that's why I'm here," said Monsour, a travel agent. Claire Major, a thirty-something yoga enthusiast who works in the restaurant trade, made the 4-hour drive from North Bay, Ont., to attend the Ottawa show because "conventional medicine doesn't have all the answers. There's got to be a more natural, more involved way to help your body." Major said she came to attend the lectures, but was disappointed with the thinly veiled sales pitches that accompanied some of them. "It's a little more commercial than what I expected," she admitted. About 2 dozen seminars, ranging from managing osteoporosis to natural alternatives for the treatment of impotence were offered. Unlike the quiet decorum of most lectures, the session on magnetic therapy turned a bit raucous. As Dean Bonlie, the Calgary dentist who heads MagnetiCo Inc., extolled the virtues of his company's mattress pad over those of his competitors, an audience member heckled: "That's not true. Be careful what you say." Afterwards, Bonlie explained that the heckler was a distributor for his competition. Rebecca McAlpine, a nurse from Manotick, Ont., who practises therapeutic touch, believes alternative therapies shouldn't be dismissed immediately. "Science and medicine is exploding. With any change in medicine, there's always a fight. The consumer has to be smart and ask questions." McAlpine was pleased with a lecture on homeopathy and children given by Dr. Jacqueline Joly, a pediatrician from Stittsville, Ont. "I was really impressed that she uses homeopathic treatments, in addition to more traditional remedies." Outside the lecture sessions, booth vendors hawked a dizzying array of items: vegetable-reducing juicers, herbal nutritional formulas, essential oils, crystals, magnets, water-purification treatments and homeopathic products. Other booths offered services ranging from ear candling, reflexology and iridology to aura readings. There was even a session on holistic healing for pets. Still, the cutting commercialism wasn't lost on some attendees. "I came today to learn and see what was out there," McAlpine said following one lecture. "Then I was disappointed when I realized that this was a sales lecture. I came for a scientific lecture." Janis Hass is an Ottawa journalist. You are going to email the following Consumers rush to buy wares at Canada's travelling "health show"
Dr. Krop gets knuckles rapped, but vows to fight college's "Inquisition"